Shonan Kai Dog Daycare is a cage free dog daycare and boarding facility in Chigasaki Shonan Japan. We accept no more than 10 dogs a day, so that dogs can get as much individual attention as they need. 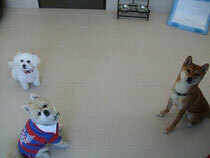 We provide daycare and overnight boarding for dogs less than 15kg(33Lb). So it is comfortable to stay for small dogs who are unfamiliar with large dogs. We brush their teeth daily as part of our Daycare and Boarding service. A professional dog trainer is always on site. * Male dog needs to be neutered.